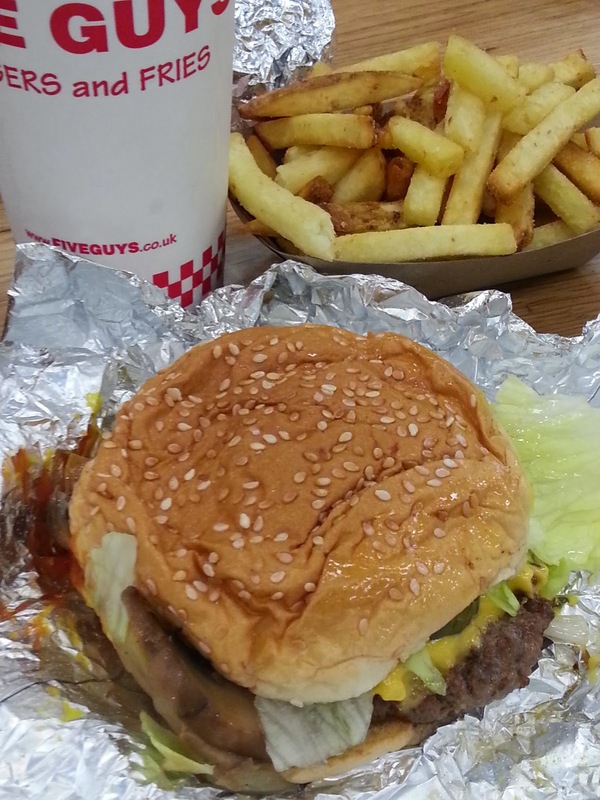 Don't Drive to Dinner: Five Guys come to Cambridge - A Review. When I was a teenager, the choice was McDonalds or Burger King - like the Beatles or The Stones, it was one or the other, not both. Although (or perhaps because) I'd been employed by McDonalds, I was a Burger King boy - mushroom double-swiss for me, thank you very much! But no one will be surprised to hear that the US has a lot of chains - both national and regional - nor that I've eaten in many of them. Texas chain Whataburger is probably my favourite - in Waxahachie they called me Sir and brought my food to the table. Oh, that Southern service! Off the top of my head, in Texas alone, we've also eaten in a Sonic, Mooyah, Riscky's, Dairy Queen, In-n-out and, of course, a Five Guys. So please forgive me if they start to blend together. Five-in-a-riscky-queen-ic. When I heard that we in Cambridge were getting a Five Guys, I was convinced we'd eaten in one in Allen, just north of Dallas. 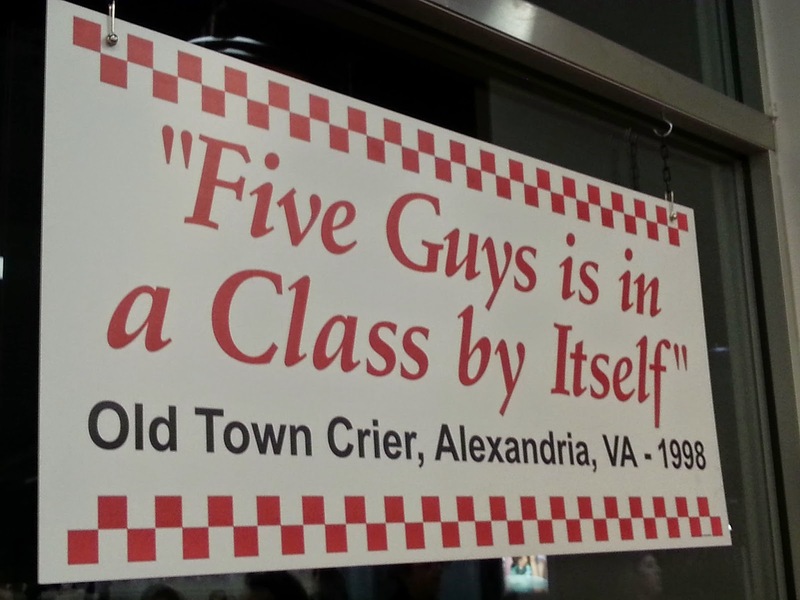 Oh yeah, Five Guys, been and done that. But Google maps tells me that must have been a Mooyah. Whoops. My family are convinced we ate in one in Rockwall, and I know better than to argue with them. So at best, I can only compare my experiences here in Cambridge with a vague and confused memory from about five years ago ('it was fine'). Perhaps that isn't a good sign? So this evening, I took us all for a slap up meal at the newly opened Five Guys in the Cambridge Leisure Park to see if it stirred any memories. It's cheaper than hypnotherapy. The Leisure Park is a strange beast. When I first moved to Cambridge, the area was marked on maps with 'there be dragons'. It was Cambridge's stockyards, a derelict area of disused cattle markets and railway sidings. The only reason to go there was the Junction nightclub, and many a night we'd stumble out at 2am not having the faintest idea how to get home. Now that's all been swept away, to be replaced by leisure-centre-by-numbers. There's a multi-screen cinema, and the usual hangers on. The Restaurant Group's Frankie & Benny's and the execrable Chiquito (where once we asked a staff member what she'd recommend, and she said 'none of it'). Add to that Nandos, Bella Pasta, a buffet Indian and Chinese and you have a pretty bland eating out experience probably replicated countless times across the country. Oh, and there's Alimentum - it looks like an upmarket hairdressers, and has a Michelin star. A more out of place restaurant you couldn't hope to encounter. And there, in the middle, where Pizza Hut used to sit, is Five Guys. Will Five Guys succeed? Well, they already have twenty branches across the UK - small fry (ha) compared with the big boys, but ousting our Pizza Hut was a bold move, and if they follow the multiplexes around the UK, they'll soon grow. 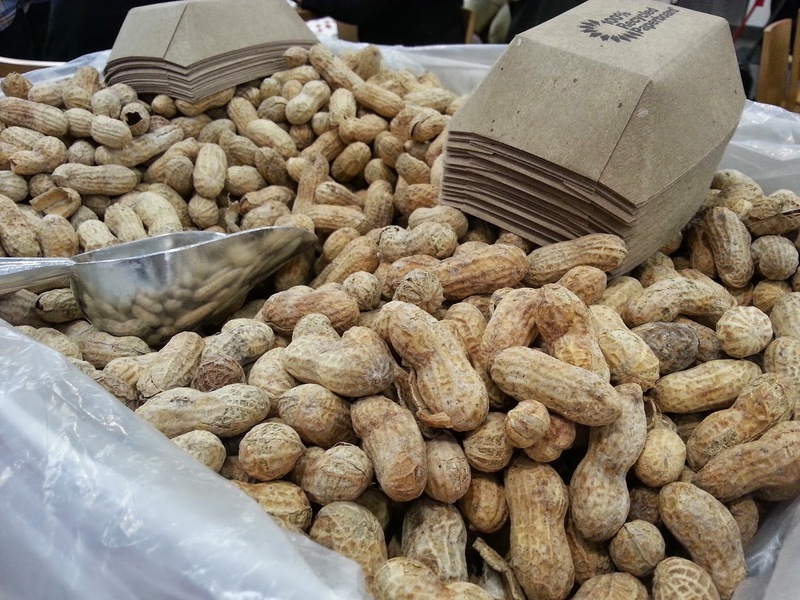 They're the fastest growing food chain in the USA, so I don't doubt that rapid growth is firmly on their agenda. But, but, what was it like? Well, obviously, I can't comment on the loud music for fear of sounding old (but Toto for heaven's sake?). It was big, bright, brash, buzzy and very very busy. I can be sure the other eateries in the leisure centre dreamed of queues at 7pm on a rainy Tuesday. It's classic fast food - you order at a till and wait at a counter for your brown paper bag. The choice is simple - plain, cheese or bacon, one patty or two, and a wide range of toppings. I had a 'small' (one patty), plus cheese, mushrooms, onions, lettuce, mustard and ketchup. Fries come in giant, vast and enormous. We chose the largest to share between three. The burger was firmly in the messy camp - I bit on one end and all the toppings slid out the other. I found myself thinking about the next time - maybe just one sauce, maybe no mushrooms, that might make a more manageable burger. Therein lies the magic of Five Guys. Because all the toppings are optional, you're forced to choose, to personalise, to make your own creation. So although I'm eating in a multi-national chain, it's an individual experience - my Tony-burger isn't your-fave-burger. And it's this that makes them stand out - not the meat (it's better than many, but not up to gourmet burger standards), not the fries (skin-on, but over salted), but the customisation. I think they're going to be huge, and every twenty something in Cambridgeshire was queueing up to agree. What did my fellow diners think? My tweenager declared it the best burger since Riscky's in Fort Worth. But give her free peanuts and she's anyones. My wife said it was 'fine'. And it was. It was 'fine'. My memories from the US weren't failing me after all.